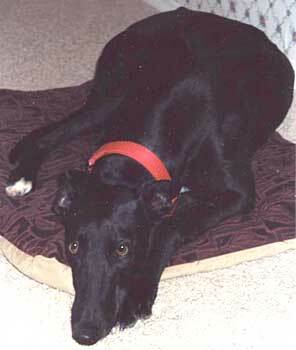 Betsy, aka Ms. Runner, is a cute black 2½-year-old female, born September 6, 2000, and is a littermate of Allie and Jenny. The three girls could almost be triplets, except for the markings on their feet. Betsy, as well as the rest of her 7 siblings, had no desire to race, so it is early retirement for her. Besides being loving and affectionate, Betsy is friendly and outgoing. She loves attention! It has been determined that Betsy is cat interested and could possibly be trained by an experienced owner with cats; she gets along well with other larger dogs, but small dogs are still in question. She crates very, very well! 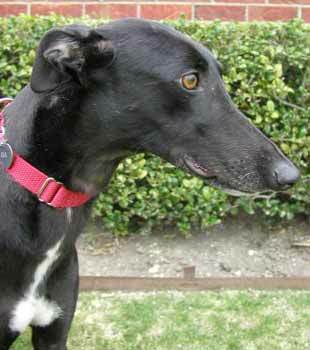 Betsy is a sweet, loving girl who has adjusted to life in a home very well. It's as if she's always been there. She had NO potty issues (maybe she learned from the boys). 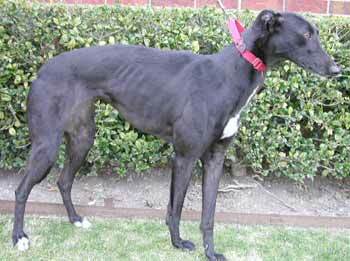 After some initial jockeying for position, she fit right into the greyhound family. I don't believe she had ever been around male dogs, so she had to set them straight in the beginning. Once she got used to being with the other dogs, she adjusted easily. She's very playful and LOVES to play with squeaky toys. She wants to take them outside but has learned that 'drop it' means she has to stop and give it to me before she goes out the door. She is crated during the week during the day but on weekends is confined in the bedroom with the other dogs if I am away from home. She loves to be petted, especially when one of the other dogs is getting petted. She does not get on the furniture or bed (nor has she tried). She responds well to 'no' and is good about not counter surfing (unless she gets reallllllly excited). She is friendly, outgoing and does not shy away from trying to be at the front of the line. Like most greyhounds, initially she was fascinated with her own reflection, but I guess that dog is old hat by now so she doesn't pay much attention to it anymore. She barks when she gets excited. She has an adorable 'little girl' bark. She is definitely 'cat and small dog interested' although I have not had her 'up close and personal' with either one. Betsy should do well with respectful children and also should adapt well in a home either with or without other dogs near her size.